If your work evolves around using e-mail all day long and you use an e-mail client like Microsoft Outlook or Thunderbird, then you may want to be able to access everything that got sent to you offline, in an easy-to-digest format. 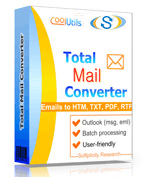 Total Mail Converter from CoolUtils is a program that will help you do just that. 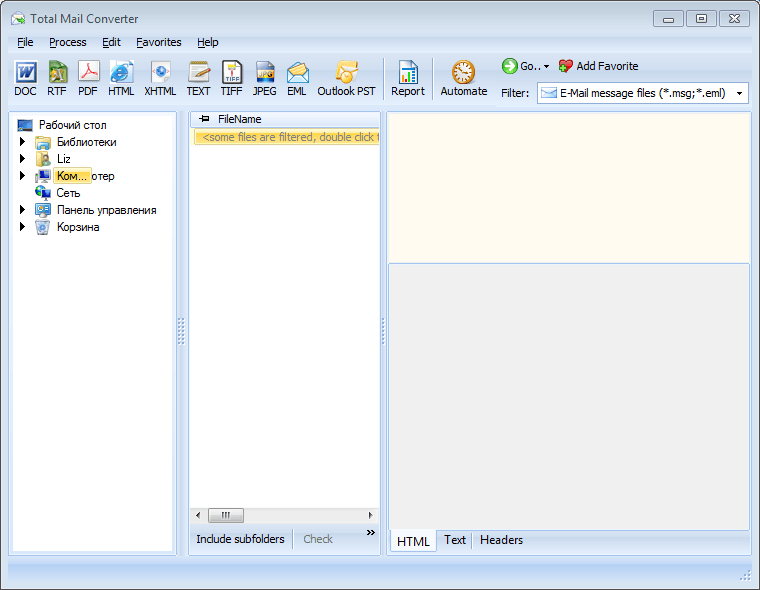 Read our Total Mail Converter review to find out more about this cool program. Total Mail Converter is a versatile program that can convert your e-mails into pretty much any format – PDF, MS Word, .txt, HTML, and more. With its help you will be able to store and access your e-mails and attachments the way you want without having to open your e-mail client and copy-paste the content. Total Mail Converter has one main feature and that’s (you guessed it right) converting e-mails from .EML and .MSG formats to whatever format you desire. The list of supported export formats is too long to post in our Total Mail Converter review. So let’s just say that it can export your e-mails as HTML, MS Word document, .RTF, .TXT, and even as .JPEG images to name a few. One of the really handy features of this software is that it can convert e-mails in bulk. You won’t have to convert messages one by one. Plus you can configure how it names converted files, which is great when you have more than a hundred e-mails to convert. Another great feature is that e-mail attachments won’t get lost in the process. Attached images will be converted as is and added to the output file. Plus you will have the option to make Total Mail Converter create dedicated folders for e-mail attachments. But the feature I liked most is something very simple, yet tremendously useful. Total Mail Converter can add headers and footers to the output documents, and they can be fully customized. Fancy adding a date or just some text? No problem! You can even use one of the built-in templates to customize how your converted e-mails look. Or, if you’re tech savvy enough, create your own CSS template. For the purpose of this Total Mail Converter review I’ve tested the program on a Windows 7 computer together with Microsoft Outlook 2007. I converted some e-mails to PDF and .DOC and everything worked fine. The only annoying bit was that the program didn’t open the folder with e-mails by default. So it took me quite a while to find the folder where Outlook kept my e-mails. Apart from the folder selection hickup I mentioned before, Total Mail Converter is fairly easy to use and configure. It’s design is a bit bland, but it’s very clean and easy to navigate. And if you ever get lost, CoolUtils have a really useful help section for this program.